It’s time to make your voice heard, hockey fans. 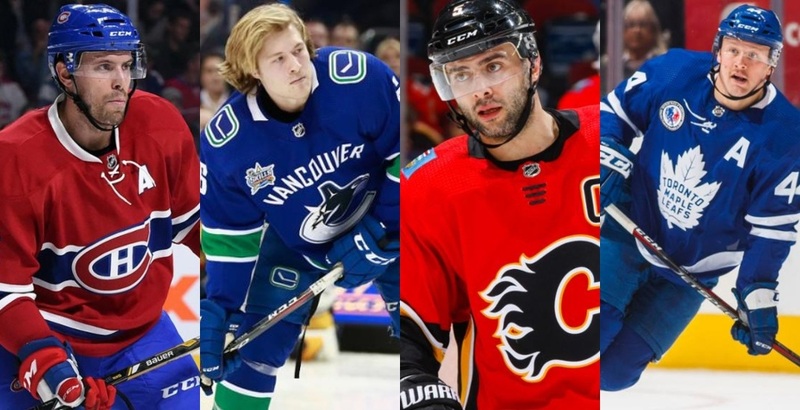 With the NHL All-Star game fast approaching, the captains have been named and the rosters are set – almost. For the first time ever, there’s an opportunity to send one more player from each division to this year’s showcase as part of the “Last Men In” vote. The 2019 All-Star Weekend is set for January 25-26 in San Jose, and here’s a look at the best bets to fill those final spots. When the initial rosters were named, there was a great sense of shock and awe emanating from Toronto as forward Mitch Marner, goaltender Frederik Andsersen and defenceman Morgan Rielly didn’t make the cut. Representing the Maple Leafs will be forwards Auston Matthews and John Tavares, who did enough to stand out from their talented and high-performing teammates. As it pertains to the vote, only Rielly was placed on this ballot, and chances are he’s going to emerge from the field candidates. For one thing, he’s wholly deserving of an All-Star spot. Only San Jose’s Brent Burns has recorded more points to date, and Rielly has emerged as not only a star player at his position, but a bona fide Norris Trophy candidate. It should be noted that Weber has indeed been in All-Star form since returning from a serious knee injury that sidelined him for a calendar year, but don’t underestimate the power of Leafs Nation; enough votes will roll in from the Big Smoke and beyond to make sure Rielly gets his due. Speaking of overlooked defencemen, Kris Letang is on pace to set offensive career highs across the board, an impressive feat for a 31-year-old. The quality of competition isn’t especially high in the Metro; Letang is up against a group of forwards that don’t exactly blow anyone away. The notable exception is Backstrom, who may book his ticket to California thanks to Alex Ovechkin’s decision to withdraw from the event. The thing with Letang is he’s had a rough go of things injury-wise in recent years, suffering from various ailments that included serious issues like concussions and a stroke. He was even unable to suit up for Pittsburgh’s latest Stanley Cup run in 2017. He deserves some love, and his star rating should stand out as the lone defenceman while the rest of the vote is split between less than interstellar forwards. This division is loaded with talent from top to bottom, but at the end of the day, it will come down to Landeskog, Forsberg, and Laine. And while Mark Scheifele and Blake Wheeler are already representing the Manitoba squad, Jets fans will no doubt be looking for the extra validation of adding a third Jet to the roster. They’re not the biggest fan base in the league, quite the opposite in fact. But Jets fans are the loudest, and you can count on them making their voices heard here. At 35, Flames captain Giordano is averaging almost a point per game for a team that’s challenging for first in the division. Calgary fans should certainly be angling for him to join Johhny Gaudreau in San Jose. At the same time, Boeser is on pace for a 30-goal season despite battling a groin injury early in the season. He should have every right to defend his 2018 All-Star MVP win. Draisaitl probably deserves the spot for putting up spectacular numbers alongside Connor McDavid and whoever else plays for the Oilers these days. However, I’ve got a feeling home ice advantage will come into play here, giving the advantage to Logan Couture. 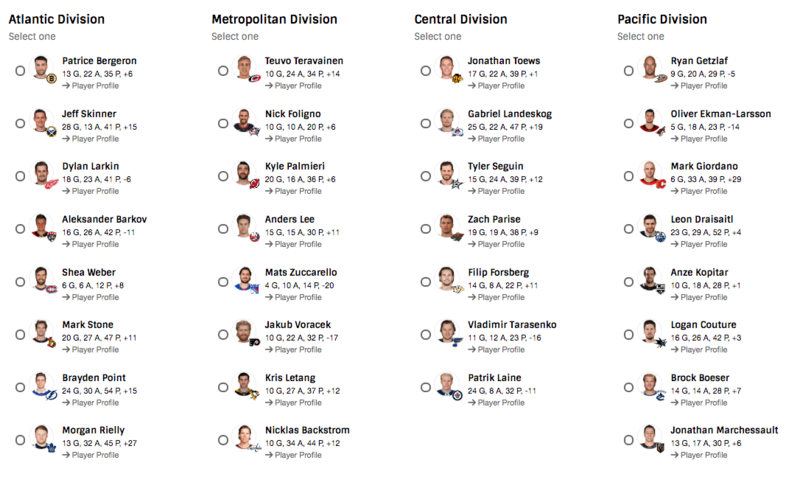 The Sharks will already be well represented by Burns and forward/captain Joe Pavelski, but the hometown fans will likely fill the digital ballot boxes with votes for Couture, much to the league’s delight. Remember: this is largely an event catered to young fans. For the good of the game in the local market, it behooves the league to have another Shark in the game, raising the odds of a crowd-pleasing MVP win. Keep in mind the rosters can change due to players withdrawing to nurse injuries or get some extra rest, so any of the players on the ballot could be added for that reason, regardless of the vote. The “Last Man In” vote ends January 1o.